No deposit is needed to go on the waiting list. 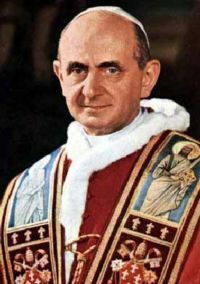 This pilgrimage is for students, parents, Alumni, faculty and staff of Paul VI Catholic High School in Fairfax, VA. Please email [email protected] if you are not affiliated with the school for alternate pilgrimage options. Join Rev. Stephen Schultz and Mrs. Joyce Krolicki on this 8 day pilgrimage in Rome, Italy, where we will stay at the Aurelia Residence in Rome, located just a 5 minute walk from the Vatican! David Martinez will be leading the pilgrimage, a long time friend and guide of past PVI pilgrimages in Rome. He has over 8 years of experience as an Official Vatican Guide. The pilgrimage is designed to immerse the students in Rome. They will be able to soak in the beauty, culture and most importantly the Catholicity of this awesome city. They will visit the churches and other holy places that are found throughout the city and pray at every church they enter. This is our primary reason for being in Rome: to encounter Our Lord in the city that most reflects His beauty and awe. However, they will also take time to experience the smells, sounds, sights and culture of Rome. This is a walking pilgrimage. Short rides on Rome’s public transportation are used to get us to the area we want to be in on a particular day. After that we will walk, a lot, so the students and adult chaperones should be prepared. We will have Mass everyday. After our morning activities and lunch, we'll enjoy some afternoon sites until around 4 or 5 pm, giving everyone time to rest up before dinner. There are over 900 churches in Rome, not to mention all the other historical sites. These churches are some of the most beautiful and awe-inspiring in the world. We will see St. Peter's Basilica, St. Mary Major, St. John Lateran, the Spanish Steps, St. Paul’s Outside the Walls, the Pantheon, the Coliseum, the Holy Steps, the Relics of the True Cross, the Vatican Museums, the Sistine Chapel, Trevi Fountain, the Forum and much more. 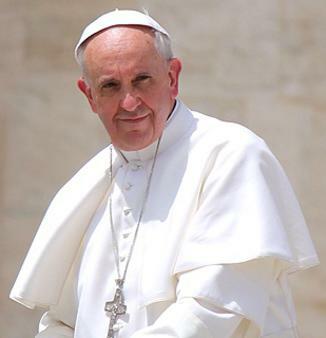 We will see the bones of St. Peter, the first pope, deep below St. Peter's Basilica, and we will see our present Holy Father, Pope Francis, at his general audience in St. Peter’s Square. We will also take a day trip to Assisi, home of St. Francis and St. Clare, where we will visit and pray at their tombs. Metro and Bus Pass for all of Rome for your entire stay. Round trip train tickets for day trip to Assisi. Tickets to the Vatican Museums and the Sistine Chapel. Tickets to the Scavi Tour: a guided tour deep beneath St. Peter's Basilica where you will see the tomb and bones of St. Peter (depending on avalability). Tours throughout Rome of some of the best basilicas, churches and historic sites. There are no other hidden taxes or fees. All other meals besides breakfast and dinner. Entrance fees to additional places not mentioned above, which are optional, like the Coliseum and church excavations. The total fee is $2990 per person/double occupancy. Your spot on the pilgrimage is not secure until we receive your $400 deposit. You will receive email confirmation of your reservation once your deposit is received. The second payment of $900 is due on June 29th. The final payment of $1690 is due July 27th. All payments should be made by check to, "Catholic Pilgrimages". If you wish to pay through Paypal a 4.5% service charge will be added. The deadline to register is May 31st. 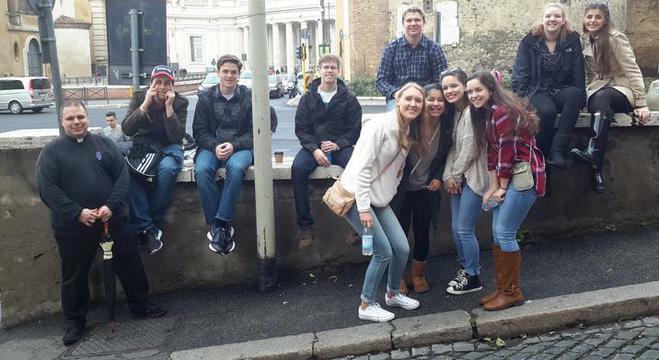 PVI pilgrims of 2016 pose while sitting outside St. Peter's Square. You will have the opportunity to choose your roommate after registration is over.